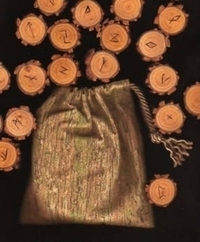 Runes & Bags - Dark Bark Rune Bag - Tarot Bags, Tarot Cards, Cloths, & More! 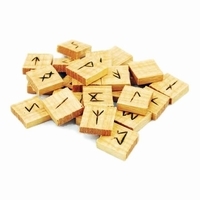 The rich colors and beautiful textures of the bark of an old tree � what pattern is more fitting for keeping your runes? We think the bark on this bag resembles that of an old oak tree. Trees play a powerful role in humanity's shared mythological heritage. One commonly shared mythos among the cultures of the world is that of the World Tree. In Germanic traditions, the World Tree is an ash tree (called Yggdrasil). To the Slavs and Finns, it is an oak. In Hinduism it is the Ashvattha, a sacred fig tree. Among the Maya, the World Tree is the ceiba tree, or "yax imix che" (blue-green tree of abundance). Many more cultures consider at least one type of tree as sacred � too many to name! 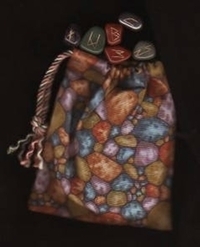 This bag, or rune pouch, will keep your dearest divination or magical tools both safe and grounded. 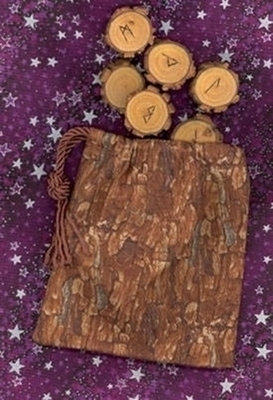 Full of earth energy, strong and flexible as the wood it depicts, this rune bag lends its strength to whatever is kept within. Pictured: Dark Bark Rune Bag with wooden runes (not included).